But the reality is when you dive in, when you really get deep into the daily lives of the people who are phenomenally successful what you discover is they have these habits that are just rocks in their lives, that keep them grounded, that keep them anchored, when things get tough, when things get great, these things keep them grounded. If you look at the lives of the saints you find exactly the same thing. The saints, they had these habits that were just sort of boulders in their day, boulders in their lives, that get them grounded, they get them anchored. And they were not extraordinary habits. They were very, very, very ordinary habits. You think about the habit of daily prayer, it’s an ordinary habit for a saint. There's not a saint in the history of the world that didn’t have a habit of daily prayer. It’s, it's a really ordinary habit. But when it’s placed in our lives as, as an anchor, when it’s placed in our lives as sort of an immovable object in every day, it becomes phenomenally powerful. You’ve got good habits, you’ve got bad habits. Sometimes we get obsessed with a bad habit. And I think the amateur mistake is to focus on that bad habit. And in many real ways, whatever we focus on tends to grow in our lives so the more we focus on it, the more we obsess about it, you know, the harder and harder it is to get rid of that bad habit. OK, yes that’s a bad habit, but let’s crowd it out of your life. Let’s, let's place new good habits in your life and crowd that, that bad habit out of your life so it has no space in your life to live. Whether you feel like you need to grow a great habit or whether you feel like you need to get rid of a bad habit, I think you have to say, “OK. What habits to I have to create to crowd that bad habit out of my life?” And maybe the good habit is the one, but chances are there's a lot of little good habits needed to crowd out a big, bad habit out of your life. And we all have them, you know? You’ve got your thing, I’ve got my thing, the things we struggle with. And sometimes we can be on a great path, sometimes we can be in a fabulous season in our lives, and in that season, you know, we tend to be able to overcome, you know, that bad habit, that central bad habit of our lives. But then seasons change. And, you know, we do experience a storm in our life. Or we do experience uncertainty in our life. And it’s very easy in those times for those bad habits to, to rear their ugly head and to have a place again in our lives. But make no mistake. Our lives do change when our habits change. If you have not been in the habit of praying daily, and you take ten minutes a day, every day, for the next 60 days, 100 days, it’s going to change your life! So how is it that you want your life to be different this year? How is it that you feel God is calling you to be different as a person of character and virtue, and then reverse engineer it, you know? Ask yourself, “OK. What sort of great habits would that person have? If I was that-very-best-version-of-myself, what would be my daily habits? My weekly habits? My monthly habits? My annual habits?” You know? A lot of great spiritual heroes had that, an annual habit of going away on retreat, or going away on pilgrimage, so it’s not just the things we do daily. But to create this ritual, this rhythm, these very powerful, powerful, powerful routines, of habit in our lives, overtime becomes incredibly powerful. It’s like the ocean, you know? You see a huge rock face at the ocean, and you ask the question, "Over time who’s going to win?” The rock face, it looks strong, right? It looks powerful, it looks immovable. But over time the ocean is going to win. In fact, the ocean is winning. If you go back and you look at where that rock face was even ten years ago, you realize, “Wow! The ocean's winning.” It might take a long time, but the ocean's gonna win. And habits, it’s like that. It’s just like the steady, in and out of the ocean. Just breaking down whatever rocks and barriers and obstacles are in our lives. 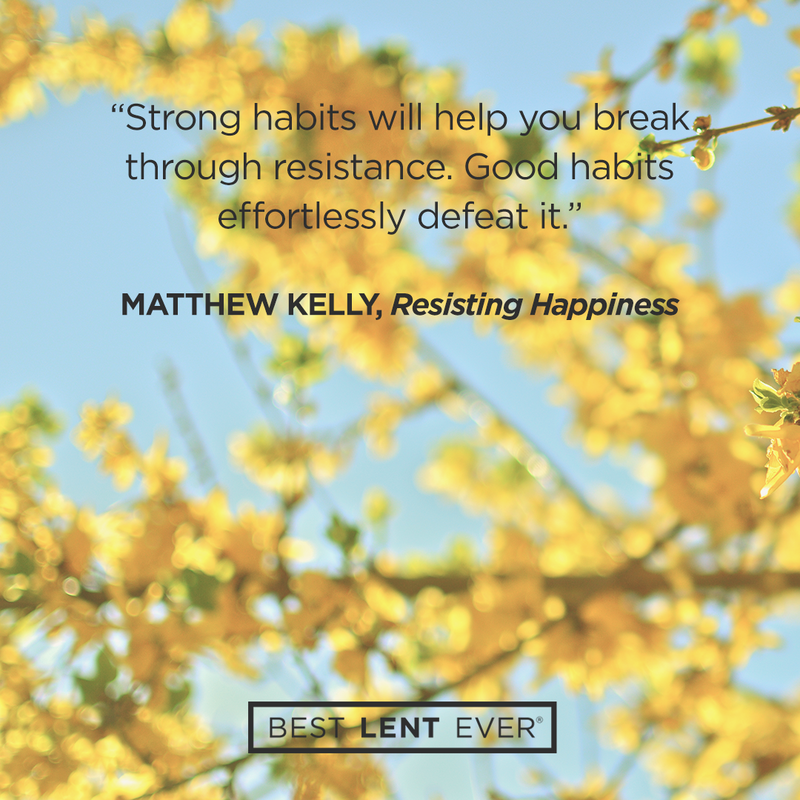 Habits—good and bad—have an enormous impact on our lives. Write down your three best habits. Now write down three habits that you need to change. Jesus, I know that every moment is a chance to turn it all around. Help me to defeat my bad habits and to embrace the habits that lead me to you. Today’s personal reflection features Dynamic Catholic team member Mary Burger. Mary is one of our event coordinators. She comes to us from Cincinnati, Ohio. Mary backpacked around Europe, loves breakfast sandwiches, used to dream of being a zookeeper, and has never eaten a Dorito. When was the last time you set out intentionally to create a life-changing habit?